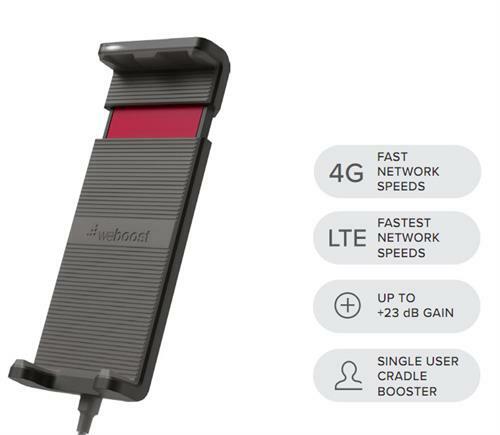 weboost Drive Sleek single phone cradle signal booster allowing users to enjoy call quality, fewer dead zones, and faster data upload/download speeds while on the road. weboost Drive Sleek is most versatile 4G vehicle cell phone signal booster. This 4G booster can boost cell signals up to 32x, enhancing 4G LTE and 3G signals for one cellular device used in a car, truck, van or RV - The device held securely in the included cradle. weBoost’s Drive Sleek is compatible with all US and Canadian networks such as Verizon, AT&T, Sprint, T-Mobile, US Cellular, Straight Talk and more. This FCC & Industry Canada Certified booster comes with all components needed for installation in one package making DIY installation a breeze. Like all weBoost products, the Drive Sleek comes with a 2-year warranty.